This beautiful fabric is a very fine and lovely linen from Joys Fabric Warehouse. The dress is a modified Burda 7494 bodice with McCalls 6706 skirt added. For the neckline I just redrew it into a v on the front bodice piece, and also dropped the back neckline slightly. I stabilised the neckline and armholes with strips of fusible stay tape interfacing immediately after cutting. As these parts of the fabric are cut close to on the the bias, they stretched out very easily in this fabric and needed careful handling. Even so, I needed to ease the fabric back into shape with plenty of steam and careful pressing prior to applying the interfacing strips. The bodice is lined with cotton lawn and the skirt is underlined with silk organza. I wanted the skirt to crease less and also have body and the organza does both these things very nicely. I added some large deep pockets to the skirt. The zipper is an invisible zip, and as I had made both these patterns before it all came together very nicely. I thought I would show quickly the very quick and dirty adjustment I made to the bodice pieces to remove excess fabric, see photos below. The front bodice pattern showing how I folded out a wedge to bring in the shoulders and reduce excess fabric in the upper chest area. I changed the neckline to a v shape and traced a size 38. The back bodice showing the wedge folded out to reduce excess fabric in the upper back and bring in the shoulders. 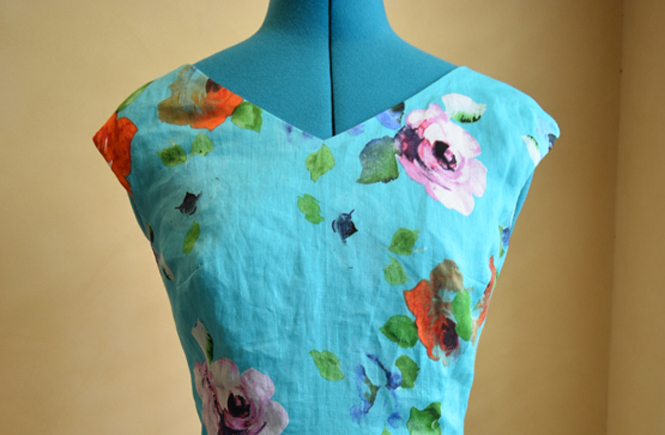 After this adjustment I traced my size (a 38) and lowered the neckline about 5/8″ or 1.5 cm. As well as removing the excess fabric in the back I also used a 2 cm or 3/4″ seam allowance for the centre back seam. This gave me a lovely fit in the back. I did not have enough fabric for “proper” pattern matching but I was able to come close on the back bodice. The only photo I have of me in the dress showing the back is blurry but I’m including it so you can see how the two simple adjustments resulted in such a nice fit. I highly recommend both these patterns, they were easy to combine together and it was also beautiful quality fabric which made it a joy to sew. Joys Fabric Warehouse is very easy to order from. In this case I saw the fabric featured in an instragram post, rang up and paid by card over the phone, and the fabric arrived in the mail just a couple of days later.